So how messy is your desk? In the bottom right are photos for bios, Facebook, and WordPress. Above them are files of stories and essays, files of submission letters and bios, and poetry files. There’s an Important Documents file. In the upper right is my husband’s chocolate book. Bottom left are paintings of women’s faces that might be useful. Upper left are pieces I’m working on. I mean, can you imagine if all this stuff sat around in hard copy? This is bad enough. So, what am I doing about it? Enter “Operation Clean-up.” File and/or consolidate. The photos in the bottom right are now in a folder called Bio Pix. Easy peasy. I can grab an active photo or add one quickly. All poetry documents are now in two folders. One has my work, plus a subfile for the work of poets I’ve used in readings. The other has some of my poems I’m thinking about for inclusion in a book. Of course, with all of this poetry rearranging, I found myself reading every piece, remembering, feeling, growing quiet, changing a word, a comma, moving on. It took time. I should have been dispassionate and simply dropped the pieces into where they needed to be. But. It’s much easier and faster to clean up the physical desk top. On my desk to the left of the screen are several small books – poetry, essays, short stories, a journal – for when I need a time out or motivation. A friend just gave me the journal. It has this quote from Isabel Allende on the cover: Write what should not be forgotten. To the right of the screen is another three tier file containing journals, a dictionary, a thesaurus, and a little notebook with info about the iMac. I call it the iMac bible. Serial number, etc. Scattered about on the desktop are paper clips in a container, a stapler, and a ceramic piece called “Picasso’s Nose” used for holding pens, pencils, and glasses. Add a lamp and a coaster for the resident bottle of water or occasional root beer. It’s basic desk. Stack, straighten, and dust. Now back to the computer screen. I have to organize the stories and essays in their respective files. I’m going to try to be dispassionate and simply file. But first, coward that I am, I’m going to drop the paintings of ladies’ faces into a new file. Then I’ll refile miscellaneous documents and pix from my husband’s book that have been pulled for various reasons. Another easy peasy. I’m afraid I’m going to have to be a nighthawk to accomplish the rest. Baby steps, I always say. Or bird by bird – thanks to Anne Lamott. Or maybe this clutter is just part of my work style? 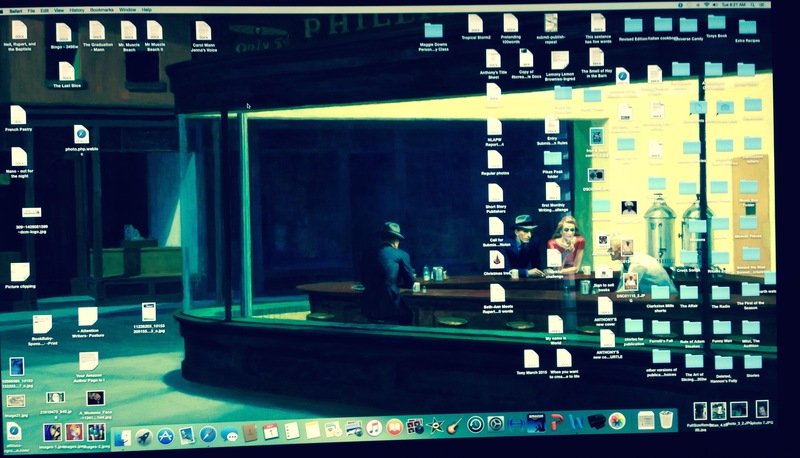 If you have any computer desktop/filing tips, would love to hear them! This entry was posted in Creativity, fiction writing, Finding Ideas: The Creative Process, Looking for Inspiration, memoir, poetry, Reading, short story, Writing and tagged Anne Lamott, clutter, computer screen, Edward Hopper, files, Isabel Allende, messy desk, Nighthawks, organizing, poetry, submissions, word.docs. Bookmark the permalink. 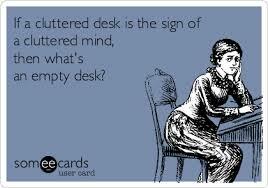 6 Responses to So how messy is your desk? You are so talented. I learn so many literary things from you. Thank you for introducing me to Isabel Allende. Hi Ruth – Glad you’re finding nuggets you like! I appreciate your stopping by. Oh my God!!!! I’m having palpitations just looking at your screensaver! I write on my laptop at the kitchen table, which we don’t use because its a mess and there is no room for plates and cutlery. It’s a good thing we have a big and comfortable island. I clean the table off when we feed company. Behind me is a desk. Ha! But it’s being used as a display for this and that and stores my writey things in drawers and baskets. Carol, on another note, poetry to be exact, take a look at this. I can see you at your laptop, surrounded by writey things! Love the word writey. Ocean Vuong touches me with his longing, with his loss.